Since father's day is right around the corner, my thoughts turn to the favorite desserts of my husband and father. 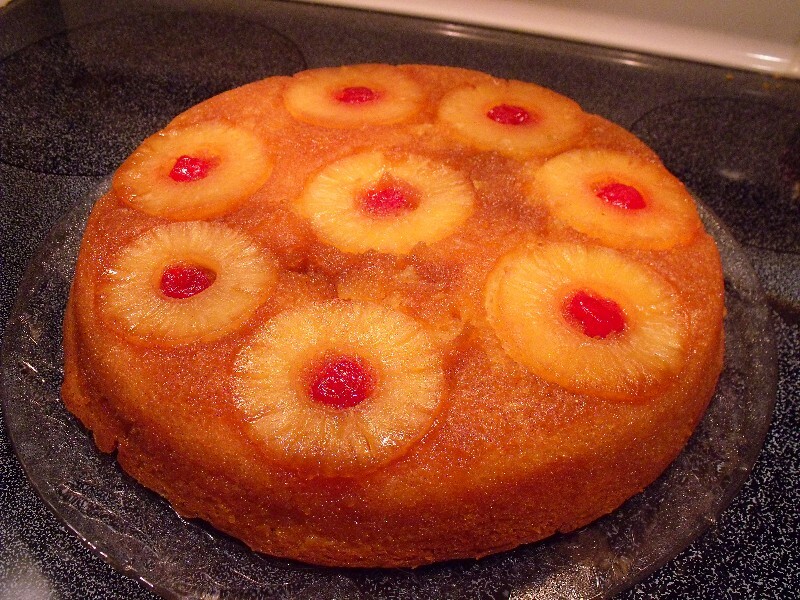 Today I wanted to focus on a dessert that is one of my hubby's all time favorites - Pineapple Upside Down Cake. For Christmas a few years back, he thoughtfully gave me some cast iron skillets (Let me tell you, that box weighed approximately 1000 pounds, I could barely lift it from under the tree). Now, I heard a rumor that these bad boys are perfect for cranking out one delicious cake, so I thought I'd give it a whirl. So the first thing you want to do, is pour the dry cake mix into a bowl. Technically you are going to almost make this per box instructions. I say ALMOST because you are going to replace the 1 cup of water in the recipe with 1 cup of reserved pineapple juice you drained from the can of pineapple rings. Everything else is the same. So after the 1 cup of pineapple juice, add 3 eggs, and 1/2 cup of oil. Mix for 2 minutes with an electric mixer until light and fluffy and set aside. In a large cast iron skillet on the stove top, melt one stick of butter on medium heat. Many recipes will call for 3/4 stick of butter and 3/4 cup of brown sugar here, but heck, the BEST part of this cake is the caramely topping so why measure so precisely? I use an easy one stick of butter, to which you add one cup of brown sugar. Turn up the heat to medium high and stir this around until it gets all melty, and gooey. Once it is all melted together, you can take it off the heat and now it is time to add the pineapple rings and cherries! Start with a ring in the center and then gently place rings around until all the space is filled up. Put a cherry into each center and then bam, already this is looking mighty fine. Now grab your waiting cake batter you set aside earlier, and you don't just want to pour it in, the pressure will make the rings shift out of place. The better option is to spoon the batter gently over the rings until everything is covered. Next you want to pop the entire pan into a 350º oven. I usually use the box directions that would be for a 9x13 pan, but check your cake after about 30 minutes and let it cook longer if needed. You want it to be a lovely golden brown. Looks so boring, right? Just you wait! Now some people will say to run a knife around the edge of the cake, and you can. I noticed the sides of my cake had pulled away from the cast iron, and I thought we would be okay but I ran the knife around just in case. You don't want this to be right out of the oven hot, but you don't want to give it much cooling time either. This is the trickiest part and please be CAREFUL. You are going to need some serious arm muscles, as the cast iron is super heavy even when empty. Now it's full of delicious cake and hot molten caramel and fruit. I was a little nervous, so I called hubby in for this part. Using oven mitts, he put our round serving plate over the top (like a lid), and with his other hand on the cast iron, flipped the whole thing over in one fluid motion. Set the serving plate down on the counter while holding the cast iron on top of it, and slowly start lifting the pan away... MAGIC! 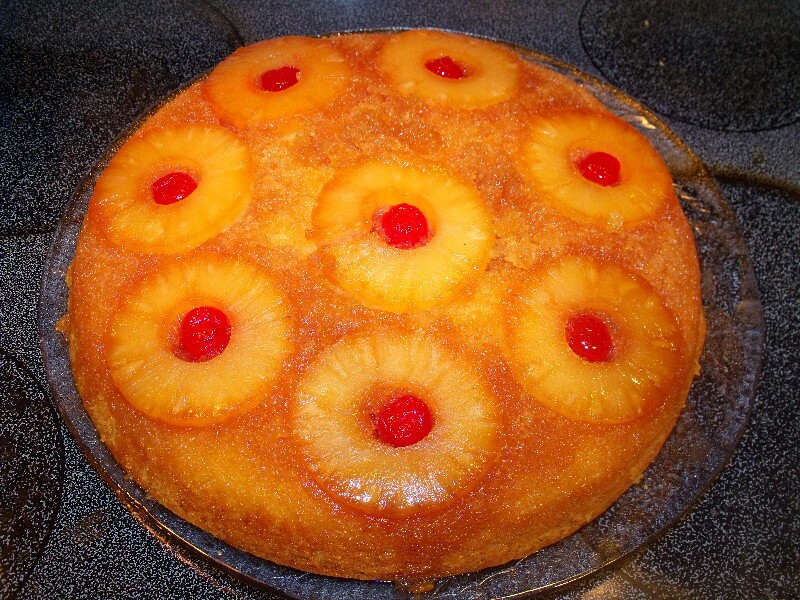 So if you have not thrown out your back in this process, you should have a lovely cake, with the pineapple all cooked through and golden. The cherries have hopefully stayed in their place. If some or a section of the topping sticks in the pan you can carefully remove it and "repair" it on the top of the cake. The ooey gooey butter and brown sugar have melting into the cake (my favorite part) Seriously, check this OUT! 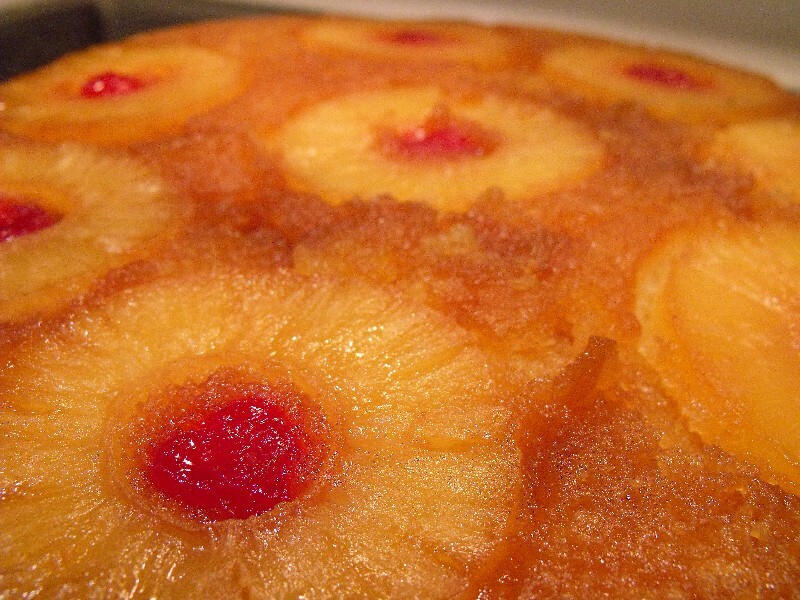 Let the cake cool completely and prepare for "oos and aahs" when you serve this masterpiece to family and friends. It's lovely by itself or served with a scoop of cold vanilla ice cream on the side. Delicious! I personally don't love the fruit as much as I love the golden caramel cake topping. I almost move the fruit out of the way to get to the "good stuff". My hubby, on the other hand, a big fan of tropical fruit of any kind, is in heaven with every bite. This is a great cake to have in your baking arsenal. Here is a link to a full printable recipe. Always makes for a dramatic presentation and tastes fabulous to boot. Enjoy!